Based on the writings of Wallace D. Wattles, who's best known for his classic masterpiece The Science of Getting Rich, and picking up where the author's Wallace D. Wattles Quick Start Guide leaves off on the subject, the Wallace D. Wattles Advanced Vision Guide will help you fine-tune your vision to get what you want in the shortest possible time with the least amount of effort. As a thank you for downloading this book, inside you'll receive free access to the author's "Constructive Science 101: 3 Keys to Getting What You Want" minicourse. Plus, you'll get a free subscription to the author's Constructive Science Newsletter filled with all-new, 100% original self-development tips and strategies to skyrocket your success. Chapter 12: How Long Will It Take to Get What You Want? This book is jam-packed with information, straight from a successful student of Wallace D. Wattles' writings. You even get access to an invaluable free bonus! If you want to get what you want in the shortest possible time with the least amount of effort, scroll up and click or tap the "Buy..." button now, or download through Kindle Unlimited. You really have nothing to lose! Important Note! 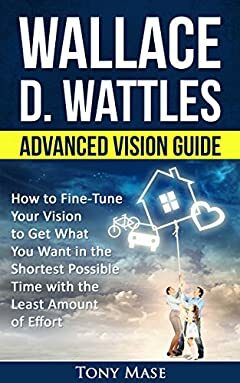 It's expected that you've completed the author's Wallace D. Wattles Quick Start Guide, which is available on Kindle, and you have a current next level vision in place before beginning this guide. Not a problem if you haven't, but you'll get a whole lot more from it if you have.